In 10 days since igniting, the Thomas Fire in Southern California has burned through over 242,000 acres, cost more than $55 million, and destroyed nearly 1,000 structures. At only 30 percent contained, it recently became the state’s fourth-largest wildfire on record. Some think it could become the largest ever by the end of the month. The lasting impact on human health and, ultimately, the lifespan of those inhaling this smoke will take longer to assess, but researchers presenting at the American Geological Union meeting this week offered new data points on what this could look like. In 2000, the absolute number of deaths attributable to fire smoke was roughly 25,000 in the U.S. By 2100, that number could rise as high as 75,000, according to research from Jeffrey Pierce, an atmospheric science professor at Colorado State University. This could include people currently living in the red blazing hell that is southern California. 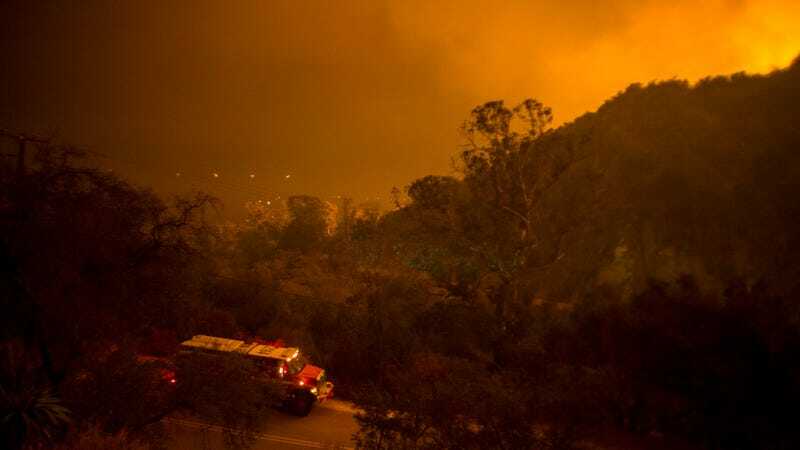 “If this is the new norm for California…and people in California are being exposed to these smoke events more regularly and in higher concentrations, then we would expect this to have an impact on the average lifetime of people in California,” Pierce said during the presentation. This impact is due to particulate matter, specifically PM2.5, which is emitted from vehicle exhausts and wildfires, among other things. When these tiny particles enter human airways, they can infiltrate the lungs and even the bloodstream, posing health risks, and, eventually, they can lead to premature death. This stuff is bad, man. Sometimes, especially in the summer, these numbers shoot way above the World Health Organization’s daily guidelines to keep levels of particulate matter below 25 micrograms per cubic meter. That’s what Pierce found in Washington state, where PM2.5 levels regularly exceeded 100 micrograms per cubic meter when wildfires burned, per his research. In Ventura County and the rest of the region blanketed by the Thomas Fire, the current air quality is listed as “unhealthy,” with the Air Quality Index valuing PM2.5 at 158. That means the current PM2.5 levels are more than 50 micrograms per cubic meter. In the future, more regions across the U.S. will be seeing air pollutant levels like this, according to Pierce’s research. By 2100, an increase in the intensity of wildfires will lead to a severe rise in PM2.5 in the Northeast and Southeast, even as people drive cleaner vehicles and reduce pollutant emissions. Fires in the West will grow more intense, too, but the change in regions like the Southeast and Northeast will be much more noticeable. “We’re making things cleaner in the Ohio-Detroit region, but making things worse in the places prone to wildfire smoke,” Pierce said during the presentation. And these health impacts cost money. Think about the number of missed work days due to the health impacts of this wildfire smoke. Between 2011 and 2014, that national economic loss reached about $100 million, per research by Ebrahim Eslami, an atmospheric science Ph.D. student at the University of Houston who presented at AGU. There’s still lots to uncover when it comes to how wildfires affect human health. For example, scientists need to look at what exactly is burning during a wildfire. Grass wheat emissions differ from, say, a structure’s emissions, said Manvendra Dubey, a lab fellow with the Los Alamos National Laboratory. Those emissions affect health differently.